Experience the astonishing world of Flik and his tiny friends like never before as the magic of Pixar animation springs to life with new crystal-clear picture and amazing theater-quality sound on Disney Blu-ray Hi-Def! Embark on an incredible journey with one little ant as he searches for a brave band of warriors to help him battle the bullying grasshoppers who threaten his home. When he stumbles upon a bumbling troupe of circus bugs instead, their only hope for victory is the bond of friendship and the awesome power of imagination. Crawling with fun-loving characters and featuring a star-studded voice cast, this epic film of miniature proportions is a "triumph of storytelling," says the San Francisco Chronicle. Plus, with all-new bonus features created exclusively for Disney Blu-ray, including a DisneyFile Digital Copy of the movie, A Bug's Life will keep the whole family buzzing for hours! I decided to watch this one again the other day. I've seen it a few times before, though this was the first Blu-ray viewing. The movie looks amazing and the improvement in the animation from Toy Story is amazing considering it is only a few years. I think the story is entertaining and interesting with likable characters and a wonderful villain in Hopper. There is a decent amount of humor to what is going - like Francis the ladybug being male - that helps to make the movie so entertaining. Some of what happens is predictable, but that doesn't keep the movie from being fun and entertaining. I love Hemilich - not sure how to spell that right now. He's just so cute. Like I said, the movie looks amazing on Blu-ray. The coloring on the ants is amazing with how it changes depending on how lights hit them. There is a iridescent look to the colors used for them that looks gorgeous. I never noticed all the details on the ants before. The locations and all the various plants and grass look so realistic. The extras on the Blu-ray are very entertaining. There is a round table discussion with Lasseter, Stanton, and a woman producer - I can't remember her name now that I really enjoyed. The first draft idea shown is interesting, though I think they did go with the better version of the story for the movie. I did like seeing the one storyboard pitch that had Joe Ranft ...he was presenting it and doing different voices. He was incredibly talented. It is really sad that he died in a car accident. This is another wonderful Pixar movie and it is well worth it to get the Blu-ray. I found this to be a very well rounded Blu-ray package as well. Best line spoken on the Blu-ray: "To infinity, and beyond"
Oh I know..I love the blooper reels. They were so funny...and creative. It would be nice if they did them again. I was sort of hoping they would return to that for Toy Story 3 - though what was shown during the credits with it is great. I can't quite decide if A Bug's Life is worth a Blu-Ray upgrade. I've double dipped on Toy Story 1 & 2, Ratatouille, Cars and Monsters Inc. 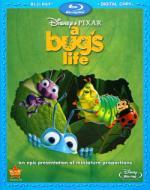 While I think A Bug's Life is very good, it doesn't quite come up to the same level as the ones mentioned, in my book. Still... Any thoughts from those who have compared the DVD and Blu-Ray? I thought it was worth the upgrade..though I may not be impartial where Pixar movies are concerned. The picture looks amazing on the Blu-ray. Ooo...that's a good point too. Yeah, I guess. But I'm trying to keep my purchases to a minimum right now. Maybe just check on the price every so often and get it if you find a good sale.